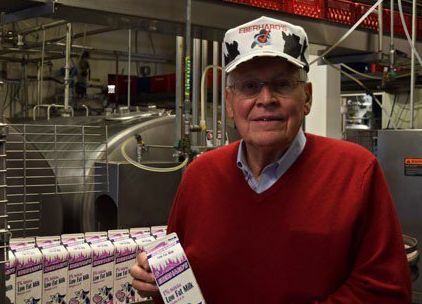 REDMOND, OR -- A local nonprofit wants to erect a statue of Bob Eberhard in downtown Redmond, to honor the long-time resident, entrepreneur and dairy owner who passed away last fall. Teri Jansen, with the 2018 class of Leadership Redmond, says it would be done by the same artist who created a statue in memory of Eberhard’s late wife, last year. "The Kaye Eberhard Memorial was a child reading a book, sitting on a stack of books. Our statue is actually going to be a life-sized bronze of Bob Eberhard." 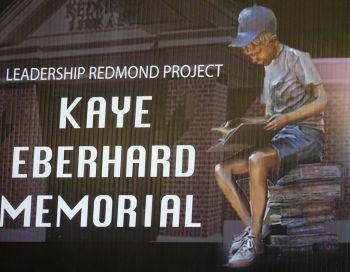 The Kaye Eberhard Memorial sculpture sits outside Redmond's City Hall, and was funded by the 2017 Leadership Redmond class. Jansen tells KBND News the Redmond Arts Committee will help determine a location for Bob Eberhard's statue, "It’ll be someplace, hopefully, in the general area, close to where Eberhard’s Dairy is now." Jansen expects the statue will cost $50,000 to $60,000 and she hopes residents will step up to help, "Everybody who speaks of him speaks with reverence. He just was a huge part of the community." She adds, "There isn’t anybody probably anywhere, practically, even in the western part of the state, who hasn’t heard of Bob Eberhard. But, we wanted to honor him here in Redmond because he was such a massive part of this community. There wasn’t any aspect of Redmond and its growth that didn’t involve him." Donations can be made at the Central Oregon Business Expo, April 18, through the Redmond Chamber, or by mailing a check to Leadership Redmond (446 SW 7th Street Redmond, OR 97756). Leadership Redmond is a registered 501c3 nonprofit organization. Checks should be made payable to Leadership Redmond, with "Eberhard memorial Fund" on the memo line.